At this time of year, I’m always looking for new and interesting ways to eat fresh vegetables, particularly those which are in abundance from the orto, which in July means courgettes (in Italian, as in American English, zucchini). 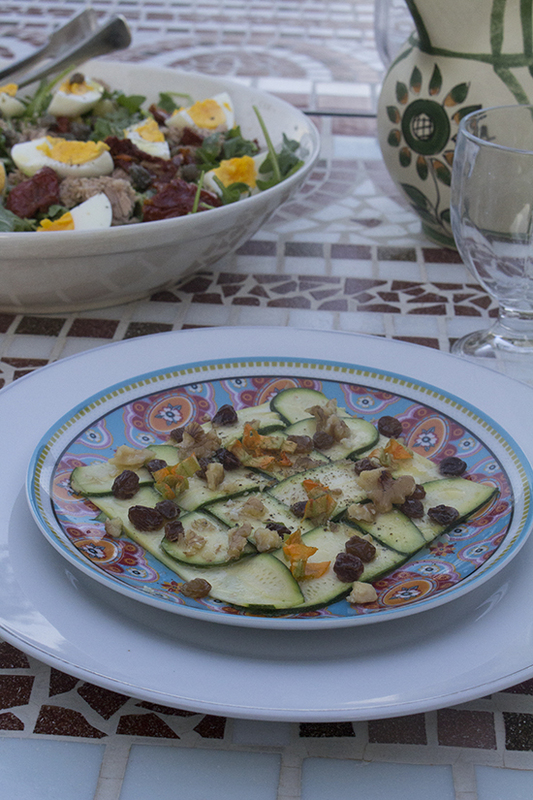 And so I came up with this version of a carpaccio using thinly sliced courgette instead of meat. This is a really delicious way of eating courgette and is actually a vegan no-cook recipe. I sliced courgettes very thinly with a mandolin (being very careful as always after my mandolin accident two years ago) and then made a little bed by weaving strips in and out—much easier than it sounds. For the dressing I chose an apple vinegar, but you can use whatever you like, even lemon juice. It’s a good idea to let the final dish rest in the fridge for about half an hour in order to let the flavours develop but also the courgette chill to refreshing proportions and eccolo! A simple, delicious, and very summery starter dish. Buon appetito! Using a mandolin, carefully cut the courgettes into 24 thin slices. Weave 8 slices into a mat and trim off the edges so that it’s perfectly square. Place it carefully on a serving place and season with salt. Repeat this three more times so that you have four portions. Sprinkle each plate with sultanas. Crush the walnuts and sprinkle them evenly on top as well. Make a dressing using 2/3 olive oil and 1/3 apple vinegar. Pour the dressing evenly over the plates and then refrigerate for about 30 minutes. Chop up the courgette flowers and sprinkle them on top as a garnish before serving. Yum! This looks great! I have far too many zucchini than I know what to do with, so will definitely be giving this a try! What I love about your blog is not just the food pictures and the detailed recipe steps, but the history. You make the reading as much of a pleasure as looking at the food and cooking it. Lovely post!